Calling it a “victory for all New Yorkers,” Gov. Andrew Cuomo signed a law to codify a woman’s right to abortion under state law and provide greater access to abortion across the state on Tuesday evening, Jan. 22. The measure, known as the Reproductive Health Act (RHA), was approved in the State Senate by a 38-24 vote, and in the State Assembly by a 92-47 vote. 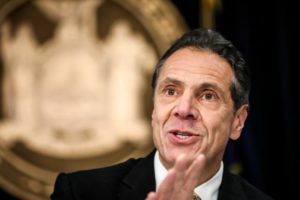 Cuomo, a Catholic, had promised to sign the measure within the first 30 days of the new legislative session and did so on the 46th anniversary of Roe v. Wade, the landmark 1973 U.S. Supreme Court decision that granted a constitutional right to abortion. The Democratic-controlled New York State Legislature pushed for this bill out of concern that Roe v. Wade could be overturned by the current Supreme Court. “With the signing of this bill, we are sending a clear message that whatever happens in Washington, women in New York will always have the fundamental right to control their own body,” the governor said in a statement posted to his gubernatorial website. The measure eliminates current restrictions on late-term abortion, including into the ninth month, and moves abortion from criminal law to a public health law, eliminating protections for pregnant women and their unborn children, including those born alive in the process of an abortion. The bill also allows non-doctors, including nurse practitioners, physicians’ assistants and other health professions, to perform abortions; and removes criminal penalties for illegal abortions, such as when someone purposely targets a mother or her unborn child in an act of violence. Passage of the law was a hard loss for pro-life New Yorkers who have been actively fighting this measure with rallies, petitions and efforts to educate lawmakers since it was first introduced by former Governor Eliot Spitzer in 2007. The NYS Catholic Conference further thanked those pro-lifers who fought “to stop this horrendous policy,” and invited prayers for the “conversion of heart for those who celebrate this tragic moment in the history of our state. Has Cuomo been ex-communicated? If not, why not? Our bishops need to take a severe stance on all Catholic lawmakers who support abortion. This modern day slaughter of the Holy Innocents has to stop. These people are all sick and the people that voted for them weren’t listening as the issue was never really isolated. I can’t believe the voters understood what was happening. The governor, who should be excommunicated, says it is a victory for all New Yorkers. Not for me and certainly not for the unborn human beings he has said it is okay to murder. Nonetheless, he and the other sick people who voted for this need prayers for conversion. They should also be directed not to suggest they are remotely Catholic. He is a murderer, and anyone who voted for the bill is also a murderer. Hope he rots in hell. When will the Cardinal excommunicate Cuomo and every Albany politician who voted for this filthy law? If Dolan does not speak up and excommunicate these low lives, then he should resign.